wall26 Canvas Wll Art - Crystal White Chandelier on Blue Abstract Vintage Background - Giclee Print and Stretched Ready to Hang - 32"x48"
Obsessed! 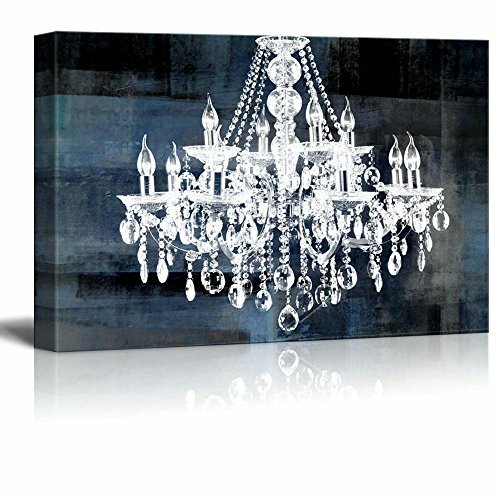 Great canvas quality and easy to hang. Amazing quality....at an amazing price!
? Absolutely love this canvas. It looks so great in person. The price was the cheapest I could find for the size and quality. The picture is so clear! Love this! They fit on the wall just perfectly! I also bought the whit one to make it look whole! I love it! Hung it over my bed. Perfect addition to my chandelier wall..